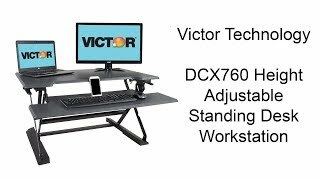 The DCX760 High Rise Height Adjustable Standing Desk with Keyboard Tray is a simple solution to a common workplace problem: too much sitting. Studies show that sitting for prolonged periods of time is detrimental to your health. 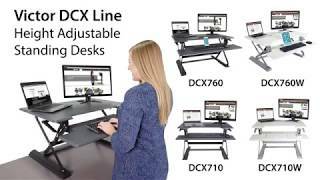 The DCX760 transforms any standard sit down desk into a sitting or standing desk. The workstation sits on top of your current desk or table and does not require clamping or attachment of any kind. Simply go from sitting to standing with an easy squeeze of the lever handles on each side of the work surface. Perfect for any environment, the DCX760 can be used in the home, professional office, or industrial work places. The large 36” wide by 23” deep desk surface is accompanied by a 35” wide and 14” deep keyboard tray. The work surface height raises to 21” and the keyboard tray raises to 16.5", providing an ergonomic working position for users of varied heights. Gas spring system allows for smooth and stable height adjustment. Sleek wood construction and durable, scratch-resistant laminate coating will provide years of use with a modern style. The DCX760 has a compact footprint and it's 22.6" frame depth easily fits on the standard 24" deep cubicle. Other features include: 2 keyboard tray slots to hold mobile devices and writing instruments, as well as a grommet hole on the upper work surface for a monitor mount. Clamp-style monitor mounts can also be attached to the DCX760, as the metal of the frame under the upper work surface does not interfere. 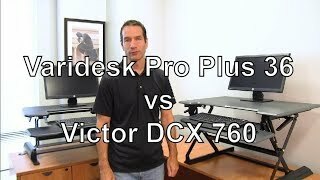 Please note that the monitor mount pictured with the DCX760 is NOT included, but available as an additional purchase.